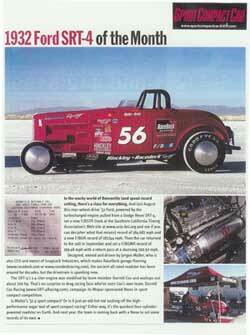 In the wacky world of Bonneville land speed record setting, there’s a class for everything. And last August this rear-wheel-drive ’32 Ford, powered by the turbocharged engine pulled from a Dodge Neon SRT-4, set a new F/BSTR (look at the Southern California Timing Association’s Web site at www.scta-bni.org and see if you can decipher what that means) record of 184.687 mph and a new F/BGR record of 187.744 mph. Then the car returned to the salt in September and set a F/BGM record of 199.48 mph with a return pass at a stunning 200.50 mph. Designed, owned and driven by Jorgen Moller, who is also CEO and owner of SnapLock Industries, which makes RaceDeck garage flooring (www.racedeck.com or www.racedeckracing.com), the ancient all-steel roadster has been around for decades, but the drivetrain is spanking new. The SRT-4’s 2.4-liter engine was modified by a team member Darrell Cox and wallops out 700 hp. That’s no surprise to drag racing fans who’ve seen Cox’s own team, Darrell Cox Racing (www.SRT-4racing.com), campaign its Mopar-sponsored Neon in sport compact competition. Is Moller’s ’32 a sport compact? Or is it just an old hot rod sucking off the high-performance sugar teat of sport compact racing? Either way, it’s the quickest four-cylinder-powered roadster on Earth. And next year, the team is coming back with a Neon to set some records of its own.